Young, unmarried woman has baby. 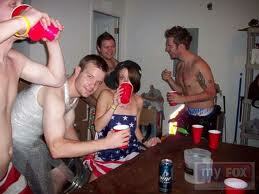 Young woman would rather party than take some responsibility. Young woman relieves herself of the inconvenience by disposing of her child. Young woman is now free to enjoy the local nightlife and. ironically, further engage in reproductive activity. She doesn’t see fit to notify anyone that her toddler is missing for 30 days. When the police are called, young woman lies, and lies, and lies. After an investigation there is sufficient evidence to charge the young woman. (“sufficient” means “enough” for those of you in Orlando who might be jurors one day). The case goes to trial; a jury is seated; the evidence is exhibited; the case goes to the jury; jury finds the young woman innocent of everything except lying. Young woman goes free. The young woman, unless you’ve been living under a rock. is Casey Anthony. But I’m pretty tired of hearing that name, so I’m going to call her Guiltsey Anthony. Yes, I know the jury said otherwise, but the jury is stupid. We all know Guiltsey is guilty, just like we all know O.J. did it; and the O.J. trial proved that juries can be brain-dead. The search continues into the night. Beverages are provided to the volunteers. I’m hearing and reading a lot of people saying “there just wasn’t enough evidence to convict”. There is a serious lack of understanding of the nature of evidence and what kinds of evidence can be used. Some people won’t be convinced unless they can see a video of Guiltsey clearly doing the deed, or if a group of eyewitnesses testify that they saw her do it, as if a person planning on killing her child just can’t wait until there’s no one around. Physical evidence (which includes forensic) is but one kind of evidence, and there’s been an over-reliance on the empirical to the near exclusion of the logical. We use logic to make inferences. If A is more than B, and B is more than C, then A is more than C. Even though we might need to empirically determine what constitutes A,B,&C, we infer by reason that A is more than C even if A and C cannot be directly compared to each other. It wouldn’t make sense for someone to say “We just can’t determine whether or not A is greater than C because we can’t directly compare one to the other”. A person making such a statement is expressing doubt, but it’s not reasonable doubt. Somehow this jury had it in its collective head that they cannot make a determination of guilt unless the case is free from all doubt. You can show these people two of something, and then show them three of something, but they won’t put two & three together. They won’t believe it’s five unless you show them five, because using logic to add two & three is just hard. It makes their head hurt. It seems like the jury looked at one piece of evidence, decided that it didn’t prove guilt beyond all doubt, then looked at the next piece of evidence and decided the same thing; going over all the evidence one piece at a time and rejecting it because no one piece by itself hit a home run in their minds. They failed to see how all the evidence came together and combine into a totality of circumstances. It’s like not seeing the forest because of the trees. What were they looking for, a sign over the body with an arrow pointing down saying “Mom did this”? With schools & universities replacing education with indoctrination, we have told students what to think instead of how to think. We’ve even strayed so far from logic and reason that some people can’t even grasp the notion that there are such things as absolutes and universal truth, without which logic and reason are meaningless. It’s no wonder, sadly, that this is the outcome. It’s going to be a real challenge trying to convince me that Guiltsey wasn’t culpably negligent at the least. So they convicted her of lying. Why? Lying about what? What did Guiltsey have to lie about? What the jurors don’t understand is everything isn’t C.S.I. They are allowed to use deductive reasoning and common sense. This is why you can convict on circumstantial evidence. This matters because Scott Peterson sits on Death Row for the murder of his wife Laci and their unborn son, convicted on far less physical evidence and with the cause of their deaths never determined. Scott could be a free man, if only his jury was as intellectually lazy as the jury who let Guiltsey get away with murder. I don’t lay claim to being the most rabid racing fan, but I’ll be looking in on the Daytona 500 today. While I don’t follow NASCAR closely enough to have any favorite drivers, I do enjoy racing in general; the cars, the drivers, the choreography of a well-practiced pit crew that can refuel and change 4 tires in mere seconds, the drama, the possibility of a close finish, and the WRECKS! (my favorite!) Right now I’m enrolled in the George Carlin school of thought – “I don’t know about you, but that’s what I’m looking for in auto racing: a nice crash and a car fire. I don’t care who wins these races – it’s the same five rednecks who win all the time anyway” I realize this statement may be the equivalent of whizzing in the Cornflakes of die-hard NASCAR fans, but all I’m really saying is right now I really don’t favor any one driver over another, plus I like wrecks – nasty, ugly, teeth-clentching, sphincter-tightening, nightmare-inducing mishaps that take out 10 cars at once, sending them in several different unintended directions, sliding sideways, spinning out, skid marks, smoke & debris everywhere. Close finishes are exciting as well. 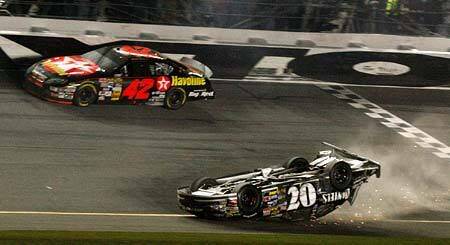 I remember the 2007 finish at Daytona, close finish but I don’t remember who won because it was overshadowed by Clint Bowyer crossing the finish line in 18th place upside down and on fire! Let me repeat that…..upside down, and on freaking fire! Well, if you can’t win you can always steal the show by making a dramatic finish. Upside down and on fire usually means you don’t finish the race, but Clint’s car slid across the finish line on it’s roof. Everyone else crossed the line with their wheels (boring!) Now the bar has been raised – how do you top that? Upside-down, on fire, and proposing to your fiance’. Upside-down, on fire, and radio in the correct answer to Alex Trebek on Jeopardy. Finish the race upside down and have David Blaine or Chris Angel crawl out of your flaming car. The Terminator crawling out of your car on fire, melting away his bio-covering to reveal it’s metal inerts. 20 midget clowns running out of the wreckage in all directions. Finding no driver at all in the car, the ultimate unsolved mystery! Super Dave Osborne cussing out his sidekick, Fuji, as Fuji is dousing Dave with a fire extinguisher. Martina McBride (hottie!) sang the National Anthem, and didn’t screw it up like Christina Aguilera (dimwit!) did at the Super Bowl. I guess if I had to pull for one driver, it would be Dale Jr. this year, being this is the 10th anniversary of Dale Sr.’s death at this same track, plus Jr. qualified for the pole position, but afterward during practice he wrecked his car and damaged it so badly that he had to use a back-up car; and the rules say if you use a car other than the one you qualify in, you have to start at the back of the line. I have a thing for the underdog. The tv ratings for this race are pretty good, but if you’ve been following my blog you know I’m always looking for ways to boost ratings, like sending condemned criminals onto the track on a unicycle just to see how long they’d survive. If they can pedal around the track for one lap (and it’s 2.5 miles around!) while juggling three bowling pins without dropping them, falling off the unicycle, or becoming road-kill, then I say they should go free, even if he was convicted of assassinating the Queen.